One of the best flowers for adding lasting color to hot, dry situations. 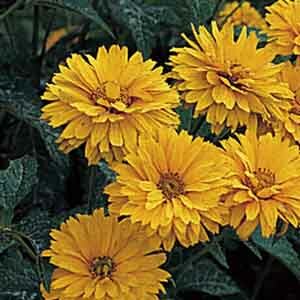 Heliopsis add a sunny, casual touch to gardens and bouquets with their long lasting blooms on sturdy stems. A quick, low maintenance solution for creating large sweeps of color. Effective in borders and cutting gardens. Excellent for planting along fences and walls. Perfectly suited to informal, naturalized settings. Cut flowers are long-lasting in fresh bouquets. Grow in fertile, humus-rich, well-drained soil. Looks best with some summer water. Remove faded flowers. Divide plants every three years for best performance.